Listening to street musicians is one of the pleasures of an evening walk in Old Town Alexandria. 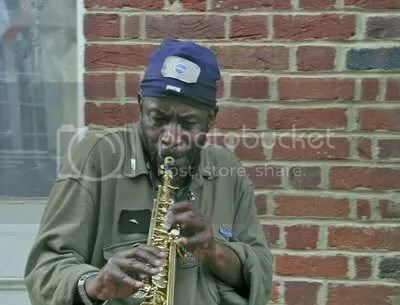 Just down the street from a guitar duo was this man playing jazz with his partner on flute. A cellist on the waterfront was playing Saint-Saens’ Le Cygne as I walked by. And a short distance away, was the musician pictured below. 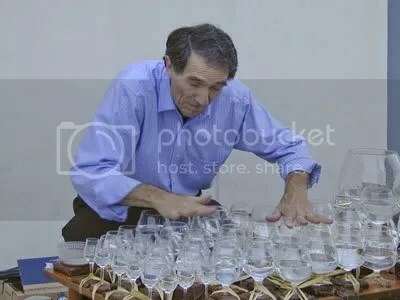 He is playing what he calls a glass harp. It’s more commonly known as a glass armonica (or harmonica). Filling containers to varying degrees with water and banging them with sticks to create a percussion instrument is an ancient technique. Rubbing the rim of a glass with a moistened finger to make a sound was first noted by Galileo Galilei and according to an article on the history of the glass armonica, in 1743, an Irish musician thought to use the technique to make music. Beethoven, Mozart, and others composed for the instrument. Hear Alisa Nakashian-Holsberg play Bach unaccompanied, on the glass armonica and two more (accompanied) examples by other performers: The Ash Grove (a Celtic melody that my mother used to sing to me in Welsh when I was a little girl) and Greensleeves. You are currently browsing the blog archives for the day Saturday, May 13th, 2006.